Toronto is known for many great things. Its weather isn’t one of them. For the city’s architecture the question is: how can public, urban space be usable and comfortable throughout the year? The architecture collective PARTISANS thinks it might have an answer. Referencing the “maze of awnings…and glass arcades” that defined Toronto streets in the late 19th century, the firm has designed an adjustable awning, somewhat-humorously called the “Building Raincoat,” that could be installed to protect the sidewalk (and its users) from the elements. Intended to be applied onto any building, or perhaps pre-planned in new construction, the ethylene tetrafluoroethylene (ETFE) structure latches onto the facade and to street pavers to create a protected space that remains transparent and lightweight, but still maintains the necessary durability to handle any meteorological assault. The Building Raincoat’s four layers of EFTE help regulate sun exposure, and the spaces between the two interior layers inflate and deflate automatically to shift the opacity of the surface in order to regulate temperature under the canopy. The firm expects the Building Raincoat to double the number of daylight hours that can be comfortably spent outside each year. Cofounder Alex Josephson told Sidewalk Talk, the publication of Sidewalk Labs and Waterfront Toronto’s joint effort Sidewalk Toronto, which hosted a presentation of the prototype of the building raincoat earlier this week, that PARTISANS took inspiration from other similar architectural typologies, like inflatables, that have been used to deal with space in experimental ways. The team iterated an array of possible structures before deciding on the three main qualities they needed: organic, folded, tensile. The raincoats have been developed in collaboration with structural designers Maffeis Engineering and environmental engineers RWDI, which have expertise in sustainability and in climate-conscious architecture. To arrive at the right stable, comfortable, and aesthetically pleasing form, the collaborators have leveraged computer modeling tools from the get-go, integrating them into the design process, rather than just using them during later testing phases. Leveraging these technologies, they’ve developed what Josephson calls a “toolkit,” an array of different related shapes and systems that can be adaptably deployed and maneuvered. “This is real experimentation where the scientific method meets design,” Josephson told Sidewalk Talk. In addition to providing adaptable protection from the elements, engineer Gonçalo Pedro of RWDI said that the Building Raincoat acts as a natural extension of the space it is attached to. It creates flexible transitions and gradations between inside and outside, public and private. While still in the experimental phase, the team hopes that the building raincoat can help shape and shift our relation to public space, allowing us to occupy the street together as much as possible. 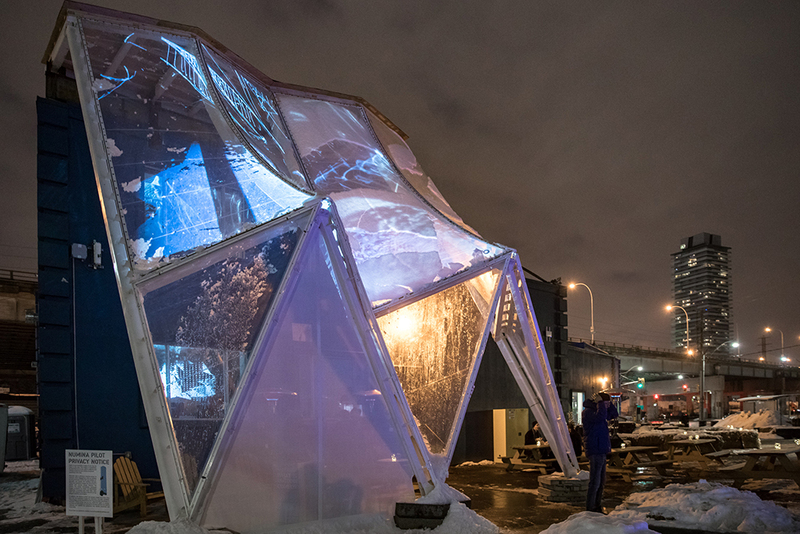 This month, they’ve put it to the test and have installed a version of the Building Raincoat at 307, Sidewalk Labs’ Toronto headquarters.